Oorto Geld - The Chip's Challenge Wiki - The Chip's Challenge Database that anyone can edit! Oorto Geld is the 24th level in Chip's Challenge 1. The weird level name is an anagram of TOGLE DOOR (sic), which signifies that the gliders must touch the green buttons. Several methods exist; the best is to get each glider to hit one button every  (the quickest pattern possible), carefully timed such that one is  behind the other, allowing one button to be hit every move. 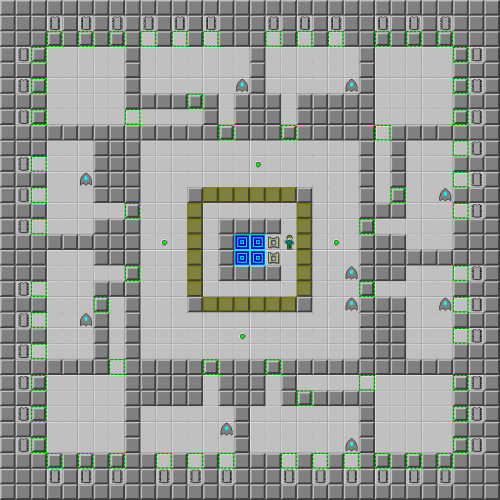 Even though this requires some extra figuring, the remainder of the level will then become trivial walking; extended waiting for toggle walls is not merely slower but can be dangerous with other gliders circling many of the rooms. This article describes the 425 route, the best known route until 426 was discovered in 2017. This has since been improved to 430; the best public route is a 428, available at the public TWS. Move (2R) 4U 2D 3L (2U  U) to split the gliders; Chip must now catch the left glider before it passes the green button. Continue 2L 3D 3L 2D 2R URULR 2U LRU 3L ULD to entrap it inside a five-block prison, then 4R URDRUD 2R UR 2U RUL to do the same to the right. Start the chips in the room just above, then go counterclockwise until 12 remain (in many areas, the toggle walls are an even number of squares apart and so no waiting will be required), and pull the lowest block onto the east along into the next room. The final room is in the northeast, and then Chip can exit.